Individual variation in feeding habitat use by adult female green sea turtles (Chelonia mydas): are they obligately neritic herbivores? Satellite telemetry and stable isotope analysis were used to confirm that oceanic areas (where water depths are >200 m) are alternative feeding habitats for adult female green sea turtles (Chelonia mydas), which have been thought to be obligate herbivores in neritic areas (where depths are <200 m). Four females were tagged with satellite transmitters and tracked during post-nesting periods from Ogasawara Islands, Japan. Three females migrated to neritic habitats, while transmissions from another female ceased in an oceanic habitat. The overall mean nighttime dive depths during oceanic swimming periods in two females were <20 m, implying that the main function of their nighttime dives were resting with neutral buoyancy, whereas the means in two other females were >20 m, implying that they not only rested, but also foraged on macroplankton that exhibit diel vertical migration. Comparisons of stable carbon and nitrogen isotope ratios between 89 females and the prey items in a three-source mixing model estimated that 69% of the females nesting on Ogasawara Islands mainly used neritic habitats and 31% mainly used oceanic habitats. Out of four females tracked by satellite, two females were inferred from isotope ratios to be neritic herbivores and the two others oceanic planktivores. Although post-nesting movements for four females were not completely consistent with the inferences from isotope ratios, possibly due to short tracking periods (28–42 days), their diving behaviors were consistent with the inferences. 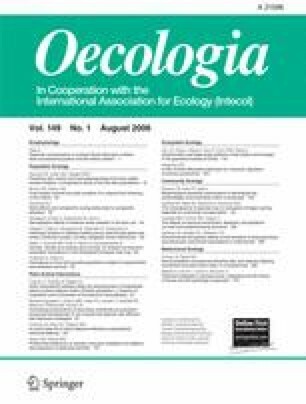 There were no relationships between body size and the two isotope ratios, indicating a lack of size-related differences in feeding habitat use by adult female green turtles, which was in contrast with loggerhead sea turtles (Caretta caretta). These results and previous findings suggest that ontogenetic habitat shifts by sea turtles are facultative, and consequently, their life histories are polymorphic. Supplementary material is available for this article at http://dx.doi.org/10.1007/s00442-006-0431-2 and is accessible for authorized users. We thank H. Suganuma and K. Narushima of Everlasting Nature of Asia (ELNA), the staff (Y. Iwata, Y. Horita, and M. Ogasawara) and volunteers of the Ogasawara Marine Center, M. Kaneko and the staff of the Club Noah Hahajima, and the fishermen of Chichijima and Hahajima Islands, for field assistance and logistical support. We also thank the Sea Turtle Association of Japan for supplying tags and equipment, and Y. Matsuzawa for discussion. T. Miyajima and Y. Umezawa of the Biogeochemistry Laboratory, Ocean Research Institute, University of Tokyo, assisted with the stable isotope analysis and allowed us to use their mass spectrometer. G.C. Hays provided useful advice on attachment of the transmitter and data analysis. M.J. Miller helped to improve the manuscript. Figure 1 was created by the Maptool at http://www.seaturtle.org. Two anonymous referees provided constructive comments on the manuscript. This work was partly supported by a Grant-in-Aid from the Japanese Society for the Promotion of Science (No. 15255003) to K.S. and a Grant-in-Aid for Creative Scientific Research (No. 12NP0201) from the Ministry of Education, Culture, Sports, Science and Technology of Japan to K.T. The experiments were conducted under licenses issued by the Ministry of the Environment and complied with the current Japanese laws.